The TSS PRO Sealant is something you can count on when you’re trying to make the most out of your stones. Are you unable to figure out how you’re going to be able to get rid of the corrosion that’s giving you a lot of grief? When you’re getting the most out of your stones and sealants without really understanding them, count on our team to help you out. We’ve got your back, and we’ll be ready to assist you in no time at all. Our lineup of all-natural and organic products will leave your stone saling needs met and protected. If you’re ready to restore your stones and then seal them for the next run, we’re ready to help. The TSS PRO-100 was the first of its kind, and we’ve continued to grow ever since. Are you trying to find a basic, all-natural sealant that can work with a lot of different stones? While you may not understand where to go for this, our company will provide you with top notch assistance. The TSS PRO Sealant is readily available online for purchase, and you’ll be able to enjoy this frequently as long as you have us around. With our team on your side, everything will be perfectly fine. Texas stone Sealers is our sister company. It can be a lot to keep track of, but we’ve been helping Americans just like you seal their stones in the best possible ways. Are you ready to figure out how you’re going to be able to find the natural sealings you’re deserving of? While this isn’t always easy to locate, you’ll beabe to find solace in our tam. We’re always ready to help our customers with the things they go through, and you’ll be glad you found us when you call us for service. Flagstone is a very porous stone, and it’s one that is going to need some type of maintenance and care. Are you trying to make sure you don’t have any type of stones that are breaking down and falling apart incessantly? When you don’t know what to do about your porous stones, it’s best to use a completely natural sealing product that gets to the bottom of your problems. If you’re going to use something with harsh chemicals, you may see some type of short-term benefit. However, over the course of time, it’s going to make things worse for your stones. If you’re a typical resident or commercial owner, you’re probably going to want something that withstands the tests that time brings. Are you ready to figure out your all-organic and natural sealing solutions? If you want something that’s going to help your sandstone, we highly suggest our TSS PRO-100 product. This is the first of many, and it’s going to be perfect for the vast majority of porous stones. Check out our menu today and figure out what you need! While this is a popular option amongst our customers, there are a ton of other solutions and sealtants that are available for you. Are you trying to figure out how you’re going to make sure your surface doesn’t’ suffer from water stains? If you’ve got some molding fears that are becoming real things, you may be wondering about what you should do about it. When you’re unable to find the sealants you truly trust, depend on TSS-PRO. 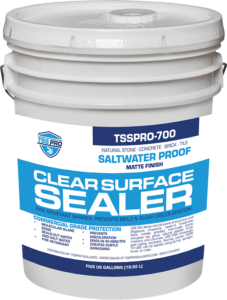 We have the TSS PRO-600 Sealant. This densifying consolidator is perfect for people who want to completely restore their stones and floors. You’re probably trying to make sure you have access to something that will stop your algae growth from completely taking over your backyard marble. While this isn’t something we want to go through, make sure you take the necessary precautions towards preventative. With our team on your side, you won’t have to worry about this for much longer. TSS-PRO Sealant takes pride in being accessible for every single American. Are you trying to figure out how you’re going to be able to make the most out of all the different sealants you’re going to be in need of? Perhaps you don’t have any type of company that offers you quality without sacrificing fair pricing. If you want a great balance, you can count on our company to provide that for you. The mission never changes here; we’re always on a mission to give our customers more. By any means necessary, we plan on making sure this comes true and gets taken care of any type we’re approached. Make sure you’re able to believe in your sealants by buying the perfect here at TSS-PRO. We only use natural and all-organic sealants that don’t do any type of harm to humans or inanimate objects. Many people make the mistakes of buying chemicals and harsh products that just don’t get the job done. If you’re looking to avoid the disappointment and infections that will come with that, it may cause some stains. Figure it out in a different by reaching out to TSS-PRO Sealant. Make sure you’re able to count on your Natural Stone Sealing by visiting our TSS PRO Sealants. We’ve got a team of professionals who are prepared to help you with whatever stone sealing procedures and needs you might have coming up. Dealing with your problems may seem like a hard struggle to overcome when you’re not familiar with stones and that’s perfectly fine with our products and services readily available, you’ll be able to count on us and our brand at all times. Check out our sealants now and find the right ones for you!